Cementing construction is a way to attach the outsole and midsole to the upper body using “cement”, or more commonly: glue. Cemented shoes can be found in all price ranges for most footwear types and is one of the most common construction methods used due to the wide range of footwear types that can be produced with a cementing construction. The construction is characterized by upper attachment to bottom (sole) by cement, without any need of stitchings or other physical bond. Due to this it's normally not an option to resole. It's also known as Compo process, Cement to welt or Stuck on construction. There is not much know about when it came about but is a natural development of the stitched footwear where sole attachment by physical bonds such as stitches was simply replaced by adhesive. A summary of the cemented process step by step. The strip of leather and stitches are not a necessity for the process. A lasting board, usually of stiffer textile or paper, is fastened to the last bottom. Then, the upper is attached to the lasting board with glue so it´s surrounding the last. 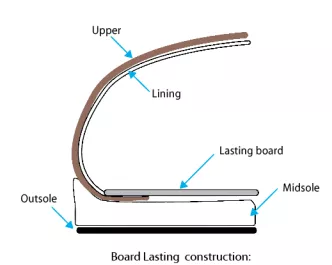 A heating process is activating the glue and the upper is tightened around the last and board by a worker’s manual pull force and a cobbler pincer. Normally the heel is lasted firstly and then the toe. The glue keeps the upper in place. There are also lasting machines for these processes. 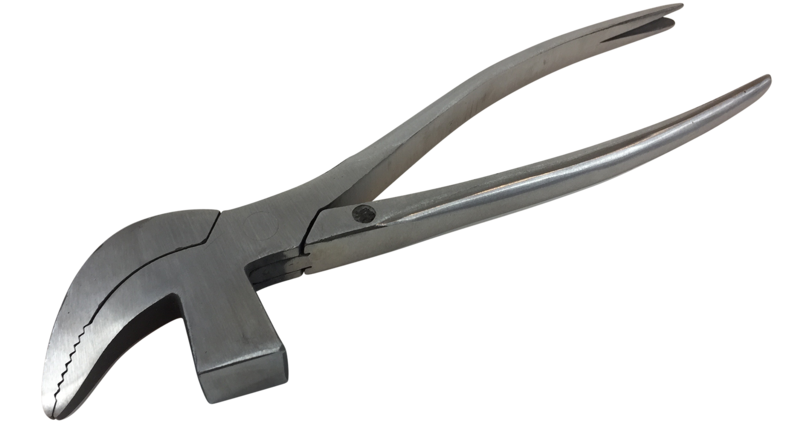 A cobbler pincer which both can force an upper around a last and press wrinkles. 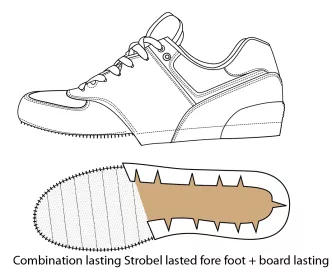 Due to the board the shoe will become more stable and less flexible compared with strobel lasting. The stiffness is also dependent on the choice of other components such as outsole and upper material. 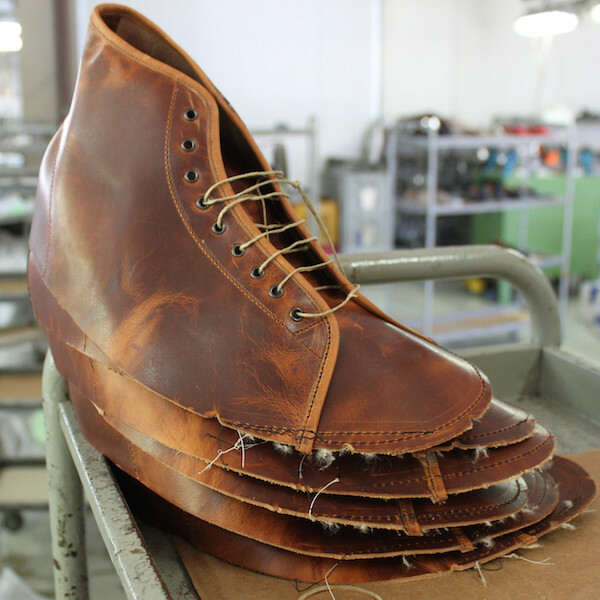 This lasting process is common among all footwear types. A board lasted upper in cementing construction. This lasting method belongs to the category of Slip lasting or Force lasting. 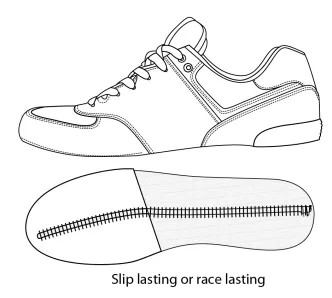 As the category name indicates the shoe last is “slipped” or “forced” into the upper. The upper is normally heated to be more flexible. The Strobel lasting method is also known as California construction. After finishing the upper the upper is stitched to a strobel insock creating a sock of the insock and upper material. This stitch is called “strobel stitch” and is a characteristic chain stitch. Semi-finished upper in stobel construction without last inserted. This stitch is normally covered by an outsole with a sidewall. The stitch can also be positioned lower to avoid this problem. 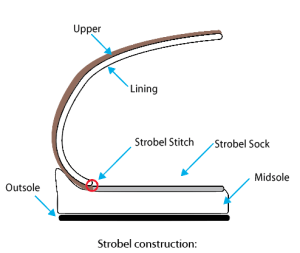 Strobel stitching to join upper and strobel insock. To finalize the lasting process the last is slipped into the sock and then the package is attached to the sole with cement in this case. It's also possible with other constructions such as Direct injection process. Since the insock is stitched and not cemented together with the upper it´s creating a more flexible shoe, making it suitable for different kinds of sneakers. Runner shoes and other athletic footwear are almost exclusively lasted by a stroble process due to the elastic and soft properties. A finished shoe in strobel construction. 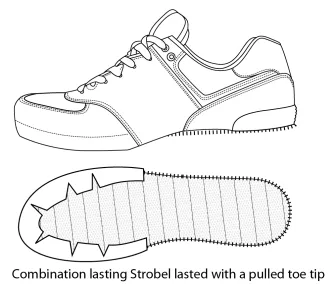 The characteristic strobel stitches can be seen along the insole edges. Strobel construction in cross section. In some cases where you want to ensure a smooth toe cap the strobel stitch is attached to the inner lining instead of upper. The toe area is extended and pulled around the strobel insock. This toe lasting is usually done with a machine to ensure a smooth toe cap and strong lasting. A method to use a prolonged upper, similar to Bologna construction to join the material in the bottom with a seam creating a insole. Normally an insock is added to cover the stitching and provide comfort. Once it´s joined together the upper is heated and a last slipped/forced into the sock. With a cooling process the upper maintains it´s shape. 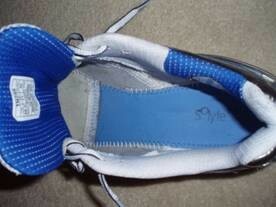 With a stable upper the outsole is attached by cement. This method does not leave any stitch on a side and allows for an outsole without any sidewall to be used. Combining the best of two worlds gives a combination lasting. Normally you want to ensure a flexible toe area you achieve with strobel construction and the stability of waist and heel with board lasting. 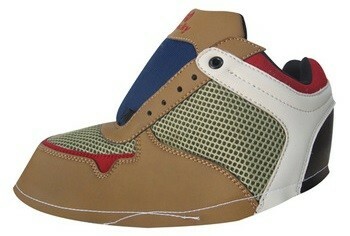 As the upper is lasted both the upper and outsole is buffed to ensure a good bonding of the cement. A heat activated primer is applied to achieve a better bonding of the cement. The upper and outsoles are heated and the cement is applied. It´s heated once again and as it comes out of the oven the two components are pressed together. To ensure the bonding it's done with a certain pressure and during a fixed time based on the product. In a big set up this full process is done on a conveyor belt, in a smaller set up it can also be done in a circular set up or individually. The production process of a cementing line in Asia. Cemented construction in more artisanal way. 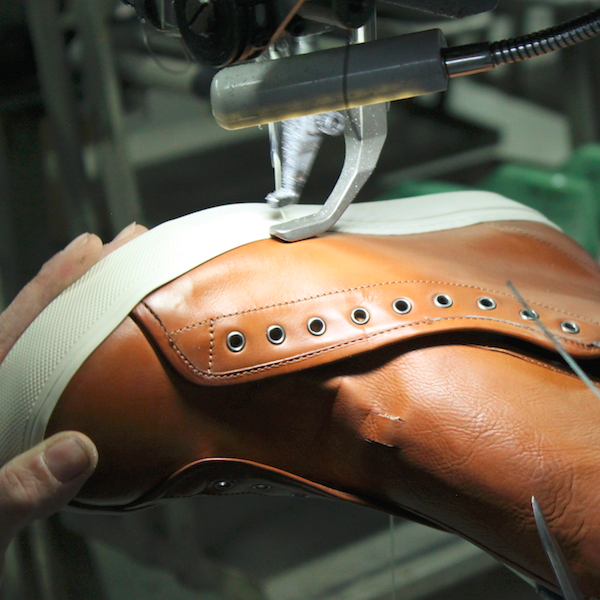 Once the outsole is attached to the upper the shoe is cleaned, inspected and put to be shipped. A sewn cup sole is not a construction on it´s own but a way to fasten a cup sole with a physical bond as well. As a complement to the cement, a line of stitching runs around the perimeter of the outsole through the upper securing a mechanical bond. This creates a stronger attachment and a more durable shoe. However, it adds a process and increases the cost of the finished product. 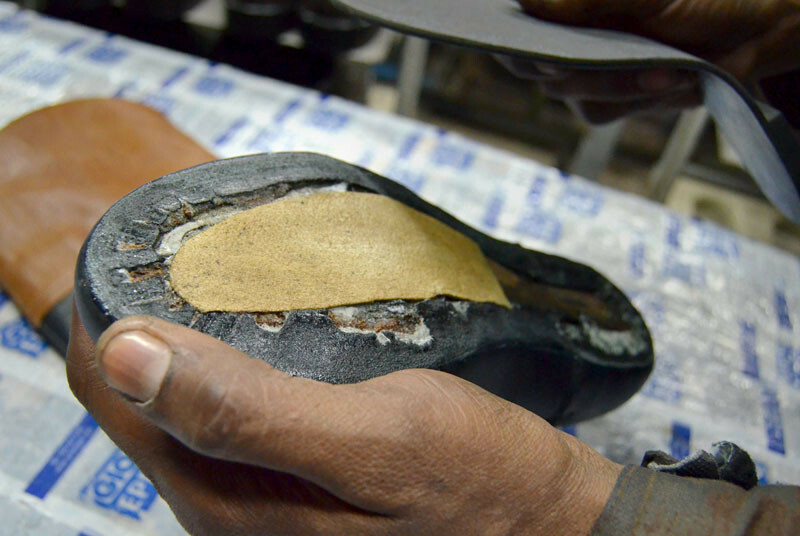 Cupsole being stitched to upper.